I've been away from The Fresh Loaf for a while. I was still baking and blogging but didn't quite have time to also update the pages here. So, I'll keep it short and sweet for few things that I baked in the past week or two. The recipe produced great tasting and chewy ciabatta. I followed the shaping method from Susan @ Wild Yeast, by not degasing the dough. This worked really well. The bread was great with potato soup with sage burnt butter. The recipe came from Peter Reinhart's American Pie cookbook. The recipe is quite similar to Reinhart's pizza dough. The herb oil contributed to great tasting focaccia. It had nice texture and crunch from wheat berries, moisture and flavour from bulgur and aroma and chewiness from wheat germ. I also included a small amount of honey to bring out more wheat flavours. Follow up on my previous post; multigrain pan bread made with 6 different types of flour, I wanted to find out the true flavour profile of mixed flour alone without the distraction of seeds and grains. This week’s bake was the result of that curiosity. The multigrain pan bread was really flavoursome, which I think was a result of tasty grains and seed mixtures. I also like to think that the flour mixture contributed to the bread’s exceptional taste as well. So, I set out to bake with just the same flour combination to find out. I also upped the flour mixture to seven, by adding corn meal into the mix. That’s all flour types in my pantry. Actually, there was one type of flour that got missed out, Italian Tipo 00 flour! Never mind, next time. Seven different flour types in the recipe were bread flour (64%), whole wheat flour (15%), rye flour (5%), durum flour (5%), corn meal (polenta flour) (5%), rice flour (3%) and soy flour (3%). I also included toasted wheat germs (can’t help myself with my favourite) at 2.5% in the recipe. The bread was lovely, chewy and flavoursome, with pronounced acidity (from mixed flour starter). However, I still couldn’t tell the flavour difference of this 7-type mixed flour bread from all-wheat sourdough. I made sourdough with 20% polenta flour (corn meal) before and the flavour was changed noticeably with natural sweetness and creaminess from the corn. One noticeable difference was crumb colour. It had lovely yellow tone, possibly from soy flour and corn meal. If you're curious to find out about the mixed flour yourself, full post and recipe can be found here. After last week’s super crusty bread, we decided to give our jaw a break with pan bread this week. Don’t get me wrong. I love crusty artisan bread but from time to time, you can’t help craving softer pan bread. I've got Advance Bread and Pastry book for a while now but haven't made many breads out of it (got a really bad habit of cookbook addiction, but not enough time to use them). Flipping through the book, I cam across Multigrain Pan Bread. Instantly, I was attractd to it for two reasons, multigrain and pan bread. I love multigrain bread for its flavour and texture (and health benefits). The recipe also has interesting technique and flour mixture. The recipe employs both pre-ferment (with yeast) and stiff sourdough starter to enhance the flavour. The recipe calls for 5 different flours; wheat flour, whole wheat flour, rye flour, semolina flour and rice flour. I ended up made it to 6, by including soy flour as well. The grain mixture is typical, which include sunflower seeds, oats, flaxseeds and sesame seeds (which I replaced them with cooked rice). This bread tasted amazing. It was naturally sweet. It had no sugar, and little amount of honey. I believe the wonderful flavour was resulted from several factors; pre-ferment & SD starter, grains and seeds, the mixture of flour and its flavour profile?. I'm actually not sure how the different types of flour would contribute to the great flavour (I'm planing to bake plain bread with this flour combination and to find out). Full post and more photos are here. My croissant project is coming along nicely. I have been practicing on croissant/laminated dough for the past couple of months. The results are getting more consistent and predictable. I usually make the laminated dough and shape few of them into croissants and the rest to something else (for change and variety). This week I made whole wheat laminated dough and made them into chocolate croissant. I made the chocolate croissants several times before by using the dough scraps, trimming from croissants shaping. They also worked fine with those scrap and was perfect way to used up those dough trimmings. Read more about Chocolate Croissant - what's not to love! I made both Vermont Sourdough and Vermont Sourdough with Whole Wheat several times in the past year but this was the first time I attempted this recipe (Vermont Sourdough with Increased Whole Grain). There were serious typos in the formula for home-bake. Mixing the dough by following the ingredient list, I ended up with a pancake batter. I have heard about the big errata sheet for the book, but this was the first time I came across the recipe error myself. Thank God that at least there was no typo in Baker’s Percentage and liquid levain built. 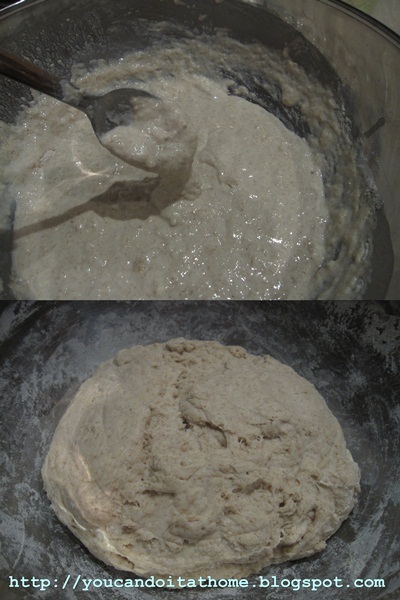 At least, I prepared starter built correctly and I corrected the ingredient errors by using the Baker’s Percentage. Thanks to the new baking stone (one-inch thick paving bluestone bought from Bunning), my bread came out singing loudly (really really loudly). It sang with crackling tunes for several minutes (no joke!). As you would expect from Vermont Sourdough, the bread was lovely with pronounced tang from increased rye and percentage of levain. I found this recipe in Dan Lepard’s Exceptional Cake cookbook. Given that it was book about cake, I didn’t expect to see baked goods with yeast in there, especially not for the dish called Krantz Cake. Apparently (quoting Dan Lepard) yeast cake is a feature of German baking. I was curious to find out how yeast leavened cake would be different from baking powder or soda. I expected the cake to have texture of soft bread, like brioche, something soft but still feel like bread. It actually turned out to be quite cakey soft, which I think resulted from the mixture of butter, egg yolks, cream cheese and sour cream in the dough. However, it wasn't as crumbly and fluffy as the typical cake. It still got some chewy texture in it which was rather nice. The recipe called for walnut, sugar and chocolate for bread filling. I replaced ground walnut and sugar with crushed peanut praline I made some weeks ago. The crushed peanut praline went well with the recipe. It gave caramelised crust and lovly flavour. The cake shape is similar to babka (cut-side-up plaited bread). Full post, more photos and recipe can be found here. Generally, I don’t make fruit breads often. Not that I don’t like them. I just have the tendency to bake more seeds and grains breads. I have two big bags of golden raisins and dried cranberry (about 1.5 kg each) from CostCo sitting and taking room in the pantry that I so wanted to use them up. Hence, there have been and will be more fruit bread baking in the coming months. This recipe came from Bourke Street Bakery cookbook from which I have been baking more lately. Their recipes produce wonderful baked goods and those photos were so mouth-watering to look at. I tweaked the recipe a little to suit my taste and preferences, e.g. replacing 10% bread flour with whole wheat, increasing the amount of water (hydration), using only golden raisins instead of mixture of golden raisins and currants. I also reduced the amount of raisins and didn’t soak them as suggested by the recipe. This is one of the tastiest sourdough fruit bread I’ve made so far. There could be few factors contributing to the great flavour; cinnamon and mixed spices, high percentage of golden raisins and sourdough starter (I started to think that having an overall high ratio of starter improves the flavour). Comparing this recipe to Jeffrey Hamelman’s golden raisin sourdough, we liked this better. Spices and more golden raisins added wonderful flavours to the bread. We totally love it. Full post and recipe can be found here, http://youcandoitathome.blogspot.com/2011/06/bourke-street-bakerys-spiced-fruit.html. It might makes you feel less guilty eating croissant. These croissants were made with 20% whole wheat flour. Would it be classified as wholegrain croissants:P? I used the recipe from Michel Suas's Advance Bread and Pastry. The recipe used preferment. The dough was quite soft and pliable and was relatively easy to work with when it came to rolling and lamination. Full post and recipe is here (http://youcandoitathome.blogspot.com/2011/05/whole-wheat-croissant-not-as-indulgent.html). Read more about Whole Wheat Croissant - not as indulgent, is it?